The Great Pyramid is on the centre of the world’s land which is the pivot point of the Nile Delta Quadrant. On its journey from its source in Africa’s largest lake the world’s longest river meets the world’s longest land meridian and plunges into the world’s greatest rift valley passes through the world’s most formidable swamp, then the world’s longest river winds back and forth across the world’s longest land meridian as it crosses the world’s biggest desert. The river’s journey reaches a climax at the centre of the world’s land where it leaves the world’s biggest desert and enters the world’s most fertile land and side by side with the world’s longest land meridian it crosses the world’s longest land parallel at the centre of all the world’s land which is also the pivot point of the Nile Delta Quadrant its geographic and geometric centre and the site of the Great Pyramid. The centre of the world’s land is one of the few places on the face of the earth that can support the Great Pyramid’s weight. If we draw a 1/10th scale model great circle of the moon around the centre of the world’s land its northern quadrant is filled and defined by the Nile Delta. The centre of the Great Pyramid’s base, the centre of the world’s land and the pivot point of the Nile Delta Quadrant are all in the same place, this is where the world’s longest land parallel crosses the world’s longest land meridian. A meridian is an imaginary line drawn on the earth’s surface from pole to pole it is of course half of a great circle of the earth, if we align a great circle to the world’s longest land meridian it divides the earth into east and west hemispheres, each hemisphere contains half the world’s land, half the world’s ocean and half the Great Pyramid. The Great Pyramid’s unique global and regional positions are functioning features of its design and if the Pyramid had been built elsewhere many of its amazing design features would not exist. The northern extremity of the Nile is the Nile Delta it fills the northern quadrant of the 1/10th scale model great circle of the moon, we have found a perfect partner for the moon model which is a 1/10th scale model great circle of the earth. Not only is the scale of the model perfect but it is perfectly placed at the southern extremity of the Nile and its north east quadrant contains the source of the Nile which is Lake Victoria. 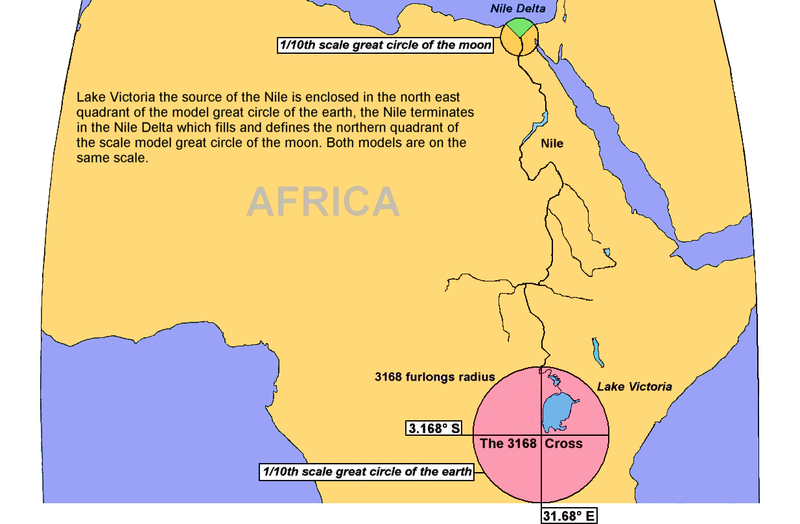 Therefore the extremities of the River Nile are contained within quadrants of 1/10th scale model great circles of the earth and the moon, the model great circles are based on geometric interpretation of geographic features, the relevance and validity of the 1/10 scale model of a great circle of the earth will be further demonstrated in the following pages. The validity of the moon model is already apparent and needs no further validation it was discovered a long time ago and has been featured in many books and magazines. The 1/10th scale model great circle of the earth is created by placing a circle tangent around the 3168 Cross, the 3168 Cross is constructed by drawing lines 3168 furlongs in length north, south, east and west from where latitude 3.168° south crosses longitude 31.68° east. The 3168 Cross is not only a major design feature but it functions as the governor and interpreter of the region’s spectacular features which conform to a geometric plan. The circle containing the 3168 Cross has a 3168 furlong radius = 31680 chains so it is a model great circle of the earth on the scale of a chain to the furlong, (the earth has a 31680 furlong radius). As you can see the 3168 Cross divides the circle into quadrants and the north east quadrant contains the source of the Nile, this is a perfect partnership with the Nile’s terminus forming the northern quadrant in the model great circle of the moon. 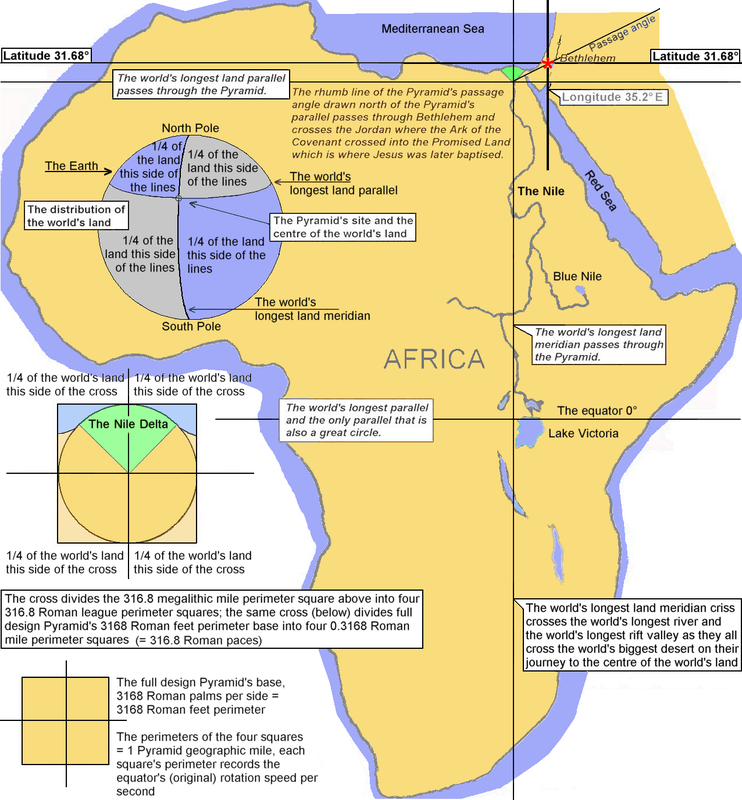 The above details are enough to validate the 1/10th scale model great circle of the earth and the 3168 Cross but there is a lot more validation in the next pages as we continue to investigate the geometric geography of Africa and beyond. The following page reveals the Great Rift Valley Crescent is a geometric design contained perfectly inside the model great circle of the earth it is also perfectly aligned to the 3168 Cross and Mount Kilimanjaro, the Crescent starts and ends on longitude 31.68° East and the Crescent ‘s only line of symmetry is on latitude 3.168° South. The dead zone’s time scale dates the Great Rift Valley at some 30 million years, if we use this time scale we have to conclude that an omnipotent intelligent force about 30 million years ago was creating a design on the map of Africa that used the British system of latitudes and longitudes and also used many other units of various measuring systems millions of years before man even existed and signed the design employing a code that used the Greek language. Ever wondered why the British system of latitudes and longitudes were adopted for universal use, the answer is revealed by the coordinates of Bethlehem and the map of Africa. The Greek language its alphabet and the system of numbers symbolized by its letters are used in the design to identify the Designer i.e. the gematria of the Lord Jesus Christ = 3168. The supposed 30 million year old design is modelled on the allegedly multi billion year old design of the earth and its moon and their designs are also prominently signed with the 3168 signature. The number 3168 refers to the head of Christianity the Lord Jesus Christ and we find this signature is used all over creation, so where are the signatures of all the other gods? It is demonstrated that monotheism existed before man invented other gods and though other forms of monotheism have been invented by man we are looking at the original which existed before man. Some people say Christianity is a relatively recent religion and even plagiarises older religions that have gods born of virgins that die and are resurrected but these fables of futile religions are actually perversions of ancient prophesies about Jesus, there are many of these prophesies in the Old Testament but these prophecies existed before the first words of the Old Testament were ever written some 3.5 thousand years ago. Jesus turned up at the appointed time in the appointed place which was no secret because king Herod tried to kill him by murdering all the babies in Bethlehem demonstrating that with the help of his advisers he knew the place and the appointed time of Jesus’ birth, this is why he knew which age group to murder in Bethlehem.